US Secretary of State Mike Pompeo brushed off North Korean charges that he used “gangster-like” diplomacy in negotiations in Pyongyang, saying on Sunday after meeting his Japanese and South Korean counterparts that he would keep pursuing denuclearisation talks with North Korea. Pompeo said in Tokyo there was still a lot of work to do, but he was confident North Korean leader Kim Jong Un would stick to a commitment to abandon nuclear weapons he made during a summit with US President Donald Trump in Singapore last month. Some US senators expressed concern about North Korea’s harsh words and urged the Trump administration to keep up the pressure on Pyongyang. Republican Senator Joni Ernst, a member of the Armed Services Committee, said joint military exercises with South Korea suspended to show goodwill toward North Korea should be resumed “soon” if talks sputter. Pompeo said that while he saw progress in Pyongyang, the United States was not relaxing the current sanctions regime or changing its “ironclad” commitment to defend allies South Korea and Japan. 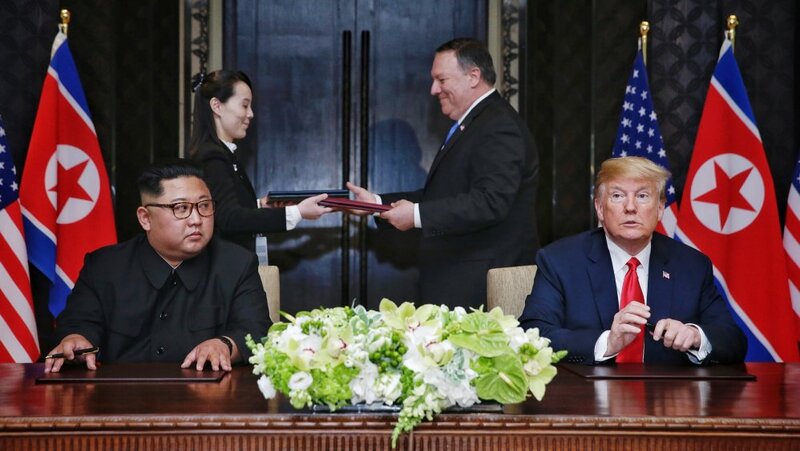 The statement was carried by the official KCNA news agency on Saturday soon after Pompeo left Pyongyang, raising questions about the future of talks in which he is trying to persuade Pyongyang to give up a nuclear weapons programme that threatens the United States. “That was a fairly serious insult directed against Pompeo,” said Christopher Hill, who formerly served as US ambassador to South Korea and lead negotiator with North Korea. Kim made a broad commitment in Singapore to “work toward denuclearisation” but did not give details on how or when he would dismantle North Korea’s nuclear programme. Trump offered security guarantees to Pyongyang and pledged to suspend the large-scale military drills with South Korea. Leaked US intelligence findings have concluded that North Korea does not intend to give up its nuclear programme completely. North Korea’s latest comments were a reminder of the difficulties that previous US administrations had negotiating with the reclusive state. “I think it was a pretty bad start to the process, but it doesn’t mean it’s over yet,” said Hill, noting that North Korea talks were tough by nature. “Most of the time you don’t come back with anything. Most of the time you come back empty-handed,” Hill added. Pompeo said he did not meet Kim on his latest visit to Pyongyang, as he had twice before, and he had not anticipated doing so. The White House said before the trip that he would meet Kim. Officials from the two sides would meet next week in Panmunjom, on the border between the two Koreas, to discuss the return of the remains of roughly 7,000 US soldiers missing since the 1950-1953 Korean War. In a speech on Sunday in Vietnam, Pompeo urged North Korea to follow the example of Vietnam, saying he believed Pyongyang could replicate Hanoi’s path to normal relations with Washington and to prosperity. “The United States has been clear on what we seek from North Korea,” Pompeo said in Hanoi. “The choice now lies with North Korea and its people. Some analysts and lawmakers have expressed alarm that the talks appear to have run into difficulties, although others see a possible North Korean negotiating ploy. “I see China’s hands all over this,” said Republican Senator Lindsey Graham, saying he thought the Chinese were “pulling back” North Korea because of the US-China trade dispute. Richard Haass, president of the Council on Foreign Relations, said on Twitter there was a danger of military action because Trump might now say he had tried diplomacy but was betrayed by Kim. “But a rushed summit and demands that NK denuclearise in short order or else is not a serious test of diplomacy,” Haass tweeted.